Here, to wish you a New Year of plenty and happiness, is an exuberant Still Life with Silver painted by Alexandre François Desportes, from the collection of the Metropolitan Museum. 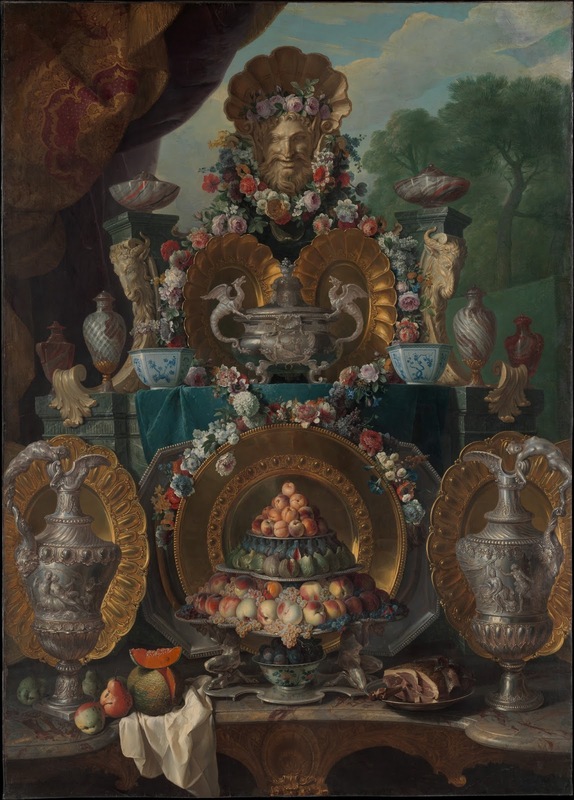 According to the notice:"This picture, probably painted in the 1720s, belongs to a type showing a buffet laden with an array of objects in silver, porcelain, and semi-precious stone as well as fruit—such as might have been displayed for a banquet. The objects may record actual pieces owned by the patron: the dragon-handled tureen and vermeil salvers are in the Régence style (ca. 1715–23)"
In fact the entire contents of a princely cupboard - platters, ewers, vases - seem to have been unpacked for the delectation of the viewer, together with a suitably lush array of flowers and fruit. It has been suggested that the painting may represent an epigram from Terence Sine Cere et Libero friget Venus("Without Ceres and Bacchus, Venus will freeze"): Ceres is represented by the harvested fruits and Bacchus by the presiding satyr and ram's heads. To make the message explicit, the silver tureen in the centre has a cartouche representing Venus and Amor. They certainly did not go in for understatement in the early eighteenth century - this magnificent monster is some 8ft 6 in by 6 feet and would have required a room on the grand scale to accommodate it. Desportes's patron is unknown, though in the later 18th century the painting possibly belonged to Louis XV's former finance minister Jean-Baptiste de Machault d'Arnouville and adorned the Château d'Arnouville. Metropolitan Museum of Art Art of the Royal Court: Treasures in Pietre Dure from the Palaces of Europe," [Exhibition of July 1–September 21, 2008]. No. 101. Catalogue, p.278-9.